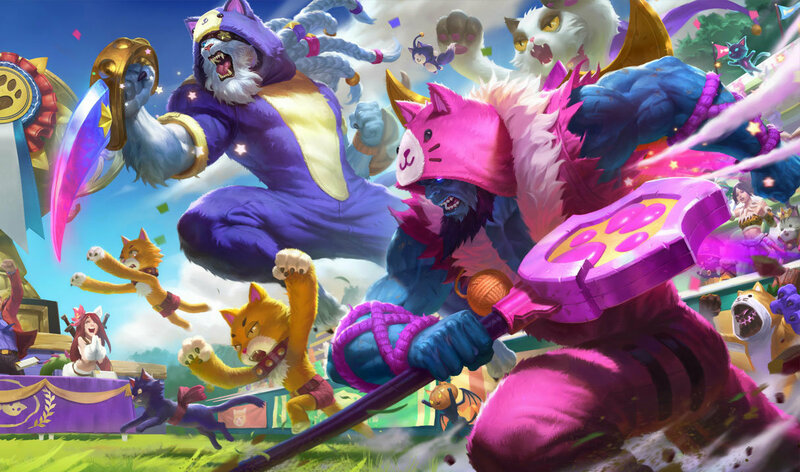 The newest League of Legends VS event is now live just in time for April Fool’s Day, pitting cats and dogs against each other to finally determine which pet is better. The event hit live servers in today’s update, and with it came a slew of new loot items, including five new champions skins, ward skins, emotes, and more. Like previous events, players can unlock unique summoner icons for free though completing event missions. For this event, however, missions will be split into two paths—one for cats and another for dogs. Once one side of the path has been chosen, players won’t be able to gain access to the other side of the missions. Missions will require players to complete similar tasks, such as defeating opponents in the dog or cat-themed skins or feeding poros in ARAM games. Outside of unique icons, rewards will be the same for missions regardless of chosen path. Fans of the game will need to complete a mission before they can choose either cats or dogs. The first mission requires players to win a game of League of Legends in any mode. Upon doing so, they will be able to choose between a Royal Kitty or Royal Doggo summoner’s icon. Whichever icon they choose will unlock the respective mission path for either cats or dogs. A second mission line, called the “Impossible Mission Line,” will be available for players to complete during the event’s duration. It requires players to either reach over 1000 movement speed after casting Nunu’s snowball in a game or to place three control wards. Depending on which option they choose, it will unlock two additional missions. The event will end on April 1 at 1:59 CT, but skins will remain available for purchase until April 15. Players can find the full mission and rewards list on the League of Legends website.